Freon Charging Hose 2500PSI Burst 500PSI Max W.P. each hose is approx.35.4inch with 1/4" SAE fitting. Manifold gauges with built-in sight glass, high pressure or low pressure is selectable. 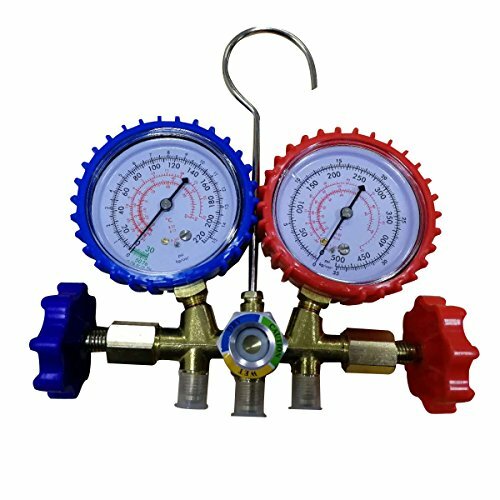 Complete diagnostic and service gauge set for use on air conditioning system with High Rate Charging, Testing, or Evacuating. Size: Approx. 22 * 15 * 6cm/ 8.7 * 5.9 * 2.4 inch (L*W*H). Couplers: High andamp; Low Pressure Side Quick Connector/Adapters (1/4" SAE Male Flare Straight). Manifold Gauges A/C Tester Freon Gas Service Diagnostic Kit with Quick Couplers. Complete Diagnostic and Service Gauge Set for use on Air Conditioning Systems (Automotive / Home). Couplers: High Low Pressure Side Quick Connector/Adapters (1/4" SAE Male Flare Straight). Complete Diagnostic and Service Gauge Set for use on Air Conditioning Systems(Automotive / Home). Max Working Pressure: 500PSI. Burst pressure: 2500PSI.